Since their deployment at the beginning of the semester, convoys of delivery robots have quickly taken the Mason community by storm. In under a week, these cooler-sized couriers had already become virtual celebrities, drawing attention from social media users, local press and even national news outlets. Most journalists have focused on the novelty of automated on-campus food delivery. But some students have had a different conversation, showing significant pushback in response to the delivery robots. 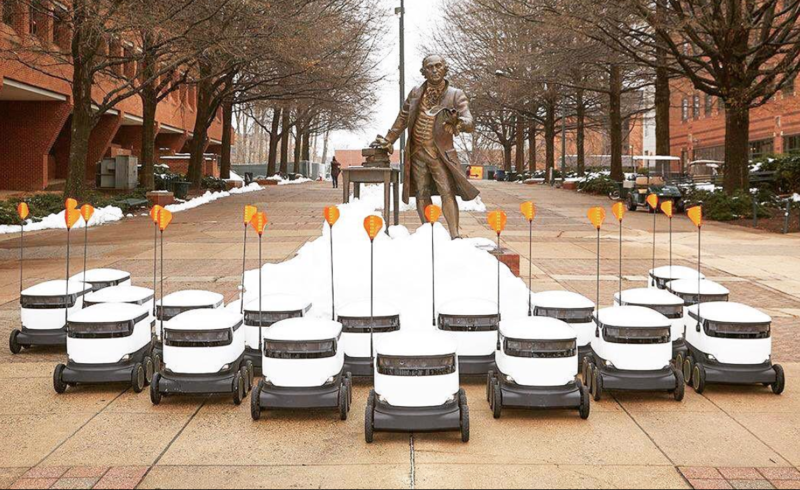 Taking to social media, numerous Mason students have expressed concerns with the robots’ relationships to university spending and student unemployment. In contrast to the discernable popular opinion, I am actually in support of the marshmallow-shaped robots. As a mechanical engineering student with robotics experience, it pains me to see my peers reject a well-implemented technology with numerous benefits based on misinformation. Thus I am making a case for the robots, because while they can bring a hot meal to your doorstep for less than $2, they cannot yet advocate for themselves. From what I can perceive, the most common objection to the delivery robots is concern over spending of university funds. Many students including myself, would like to see Mason make improvements to campus infrastructure such as Wi-Fi, housing and parking before purchasing automated food delivery robots. 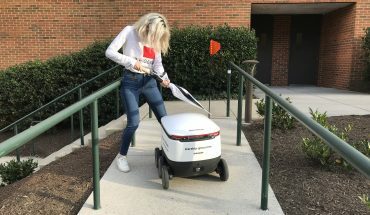 As announced on their website, Sodexo (a Fortune 500 company and Mason’s dining contractor) struck a deal with Starship Technologies, the manufacturer of the robots, to bring automated delivery to campus locations globally. Therefore Sodexo, not Mason, is paying for the robots’ expenses. Knowing that Sodexo pays for the robots eased my concerns about poor spending by the university and allows me to appreciate the robots more. Now I can order my food in peace knowing that my tuition can still be used to address the more pressing needs on campus. It is an understandable reaction to question your job security when you see a robot doing a job that you are accustomed to seeing a human do. Though while automation replaces jobs, it also creates new ones with higher compensation and more skill-focused work rather than through repetitive or menial tasks. 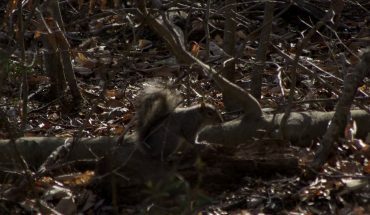 In the case of our campus, the robots are responsible for creating new jobs in Fairfax. They will not require the physical labor of travelling door to door, but rather the work of supervising the autonomous robots remotely instead. This is exciting to see because I know that my work in robotics can not only improve the efficiency and convenience of everyday life, but can also improve both working conditions and job satisfaction for others. Delivery robots are a trend that is here to stay. Research has predicted that in the future 80% of last-mile deliveries will be conducted by automated couriers. There are already more than half a dozen robotics startups doing ground delivery alone, not to mention the potential market for drone delivery. As if that wasn’t enough, retail giant Amazon has long had plans for Prime Air delivery and recently announced their new ground delivery robot named Scout as well. I think it is incredible that modern technology has yielded robots that can both safely navigate our campus and deliver food at a low cost. This excites me as a robotics engineer for the future of automated technology. Also, if the robots don’t spend our tuition money or take our jobs, what is the problem? Besides, if the trend of robotic delivery is here to stay, we should embrace it at Mason. After all, innovation is our tradition, is it not?